Having been alongside the jetty at Glen Mallan since 29 October, the Royal Fleet Auxiliary FORT ROSALIE sailed down Loch Long this morning. At the entrance to the loch, she conducted a man overboard exercise, and is seen here in the process of recovering her rescue boat off Cove. 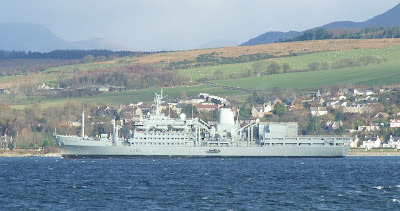 She then continued into the Gareloch, and is now berthed at Faslane. FORT ROSALIE was built at Greenock in 1978, and was originally named FORT GRANGE.